In the middle of spring, a magical thing begins to happen outside. In addition to the greening of the earth, we notice a change in the local wildlife. Suddenly, squirrels and chipmunks are everywhere. Birds are twittering away madly in the trees, worms are popping up right and left in the soil, and everywhere you look, life has returned. In particular, you'll see bees buzzing around your garden, partaking of the rich pollen in your flowers and herbs. The plants are in full bloom at this time of the spring, and the bees take full advantage, buzzing back and forth, carrying pollen from one blossom to another. "Even in modern folk magic bumblebees serve as a as a charm for health and wealth. Bee stings were said to treat the pain of rheumatism and arthritis (something modern science is investigating), and honey has been used in folk magic to treat just about any and every ailment mankind has ever been known to suffer with. The Witchcraft Museum in Boscastle retails a charm, promising health, happiness and good fortune that features three ceramic bumblebees in a blue pouch–this is a vast improvement on the old folk charm it is based on, found in Dawlish, that sadly featured three dead bumblebees in the bag. Bees have long been associated with witches and witchcraft: one Lincolnshire witch was said to have a bumblebee as her familiar animal, another witch from Scotland allegedly poisoned a child in the form of a bee, and in Nova Scotia a male witch was accused of killing a cow by sending a white bumblebee to land on it." 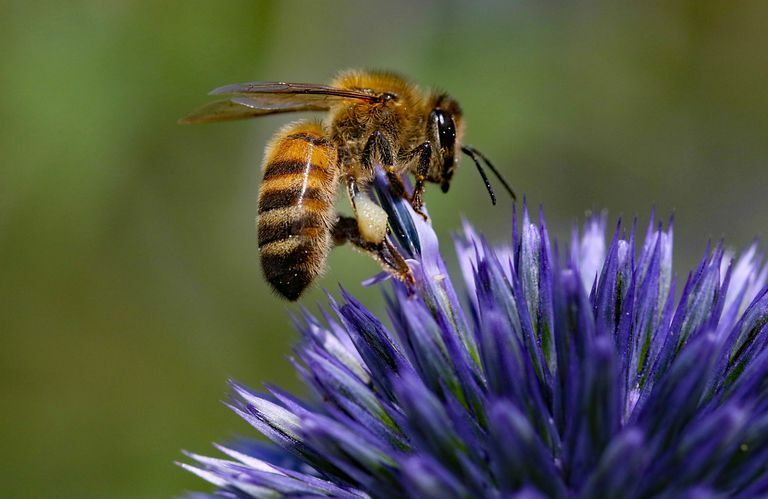 Finally, it's important to keep in mind the impact that bees have on our environment - bees benefit other living things by pollinating plants. This, in turn, effects our food supply. Without bees to spread pollen, it's estimated that a significant percentage of crops - and thus, food - would vanish from our planet.